What looks like your ordinary light switch is actually a super (duper) bright night light in disguise! The ingenious design allows you to add a light to any space. Make no bones about it, this is the finest Light Switch Light on the market because this features the latest LED technology of COB LED's which are not only bright, but will last virtually a lifetime! Plus it will aways stay cool to the touch making them great for kids rooms. It's simple, yet innovative design makes it great for bathrooms, children's rooms, garages, closets, pantries, and tool sheds. It's even perfect for large tool boxes, truck boxes, RV's, and campers. No need to call an electrician, you can have a bright light wherever you want it without expensive wiring or installation. To use just flip the switch. It's that easy! Perfect for closets, basements, hallways, bathrooms and more. ☀【SUPER BRIGHT】 2 COB LED panels on each switch, easy enough forWardrobe, Camping, Kitchen, Garage, Attic, Night Reading and More. It is also perfect to keep the house around in blackout and nighttime use. 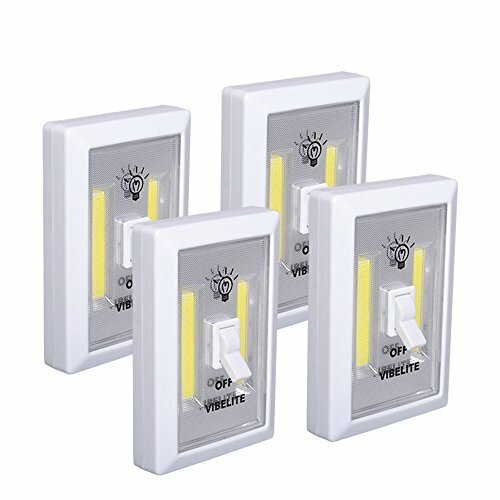 ☀【PACKAGE CONTENT】 Pack of 4 COB closet lights. With a set of installation screws and a user manual. ☀【WARRANTY PROMISE】 12 Month Warranty and the 100% VIBELITE Customer Satisfaction Guarantee - Backed by the VIBELITE customer satisfaction guarantee. We will always replace a faulty product or refund your purchase. Just contact us if you have any problems. If you have any questions about this product by VIBELITE, contact us by completing and submitting the form below. If you are looking for a specif part number, please include it with your message.